This week, delegations from around 100 countries are meeting in New York to discuss investor-state dispute settlement (ISDS). ISDS is a provision in more than 3,000 investment treaties that gives corporations the right to sue national governments through arbitration, circumventing national judicial systems, whenever they find that governments infringe upon their rights as investors. After 942 ISDS cases, a growing number of countries, NGOs and academics are voicing their concerns about this provision. ‘Big corporations and the super-rich, along with the arbitration industry [the lawyers who argue ISDS cases] are by far the main beneficiaries of ISDS’, says Canadian professor Gus Van Harten. Within a working group of a UN commission (UNCITRAL Working Group III), delegates from 60 countries will convene this week for the fourth time, along with observer delegations from countries including the Netherlands, to address concerns over ISDS and design reforms. These negotiations began in 2017. Critics who attended the meetings claim that advocates of ISDS (certain powerful countries and lawyers from the ‘arbitration industry’) have a strong influence over the agenda during the talks. Whenever critical delegations like South Africa have the floor, ‘their criticisms sometimes don’t even make it into the official reports’, says New Zealand legal scholar Jane Kelsey. ISDS lawyers appear to hold administrative positions within the working group and are represented in large numbers in the advisory bodies that have been established for the working group. There are also external ‘observer’ organisations consisting mainly of lawyers and corporates, while civil society is underrepresented. ‘Broader criticisms are being ignored’ during the talks, says Kelsey. In her view, the talks will result in ‘old wine in new wineskins’. One of the proposals on the agenda is a permanent investment court. According to the EU, this will address ‘all concerns’. Professor Van Harten says, however, that a permanent court could end up ‘institutionalising [ISDS] without addressing the key flaws’. When South African President Nelson Mandela signed bilateral investment treaties with Italy, Belgium and Luxemburg in 1997 and 1998, he probably never suspected that his actions would later impede anti-apartheid policy. Yet, when Mandela’s successor and party colleague Thabo Mbeki wanted to address the economic disparity impacting the black population, that is exactly what happened. Mbeki was in the midst of drafting new mining legislation. This was intended to revise existing concessions made by mining companies and guarantee that 26 percent of shares in these companies would be owned by black shareholders from now on. This law was to apply to all companies, regardless of their country of origin. However, foreign mining companies found a powerful legal defence in the investment treaties that Mandela had signed: so-called ISDS clauses. According to South African lawyer Jason Brickhill, South Africa had enacted the treaties at the time ‘ with ‘no real understanding’ of what these clauses contained. ISDS stands for ‘investor-state dispute settlement’. Since this clause first appeared in 1968 in an investment treaty between the Netherlands and Indonesia, ISDS has been included in over 3,000 trade and investment treaties. This instrument gives corporations the option to sue national governments whenever they find that their rights as investors are being violated. And that is exactly what the Italian mining company Foresti did. In 2007, the company demanded $375 million in compensation during an ISDS suit against the South African government on the grounds of unlawful expropriation. Foresti’s suit was a success – not because they won, but because Mbeki granted them an exception: unlike other mining companies, Foresti was only required to transfer 5% of its ownership to black shareholders. After Mbeki agreed to this concession, Foresti dropped the case. This week, delegates from around 100 countries will meet in New York for a critical debate on ISDS, a legal provision that has now existed for more than 50 years. South Africa is currently at the forefront of nation states calling for fundamental change. Since 1968, 942 ISDS cases have been heard, most of which took place in the past two decades. To date, 602 have been concluded. ISDS cases are heard not in national court systems but within so-called arbitration tribunals. These tribunals consist of three selected arbitrators: top lawyers who are specially chosen to preside over the case for a fee. To its proponents, ISDS is a ‘win-win’: good for governments, good for corporations. According to Charles Brower, a leading lawyer who is very much in demand as an arbitrator, ISDS guarantees that conflicts between investors and their host countries are heard in ‘neutral fora’ (i.e. arbitration tribunals) instead of within the ‘politicised’ national court system. For 50 years, says Brower, this has enabled ISDS to live up to fulfil ‘its promise of increasing foreign direct investment where it has been most acutely needed’. According to the International Chamber of Commerce, ISDS provides investors with a legal safeguard that is actually vital for attracting investment. Opponents see ISDS as a one-way street: the provision allows corporations to sue national governments, but not vice versa. There is also no way of appealing against a decision by the arbitration tribunals. In a quarter of the 602 cases that have been concluded, the plaintiff (the corporation) was awarded its claim, with an average amount of around $504 million. Another quarter of all concluded cases have resulted in settlement, in which the amounts awarded are unknown. In most cases, the corporation filing an ISDS claim comes from a wealthier country such as the United States, the United Kingdom or the Netherlands. 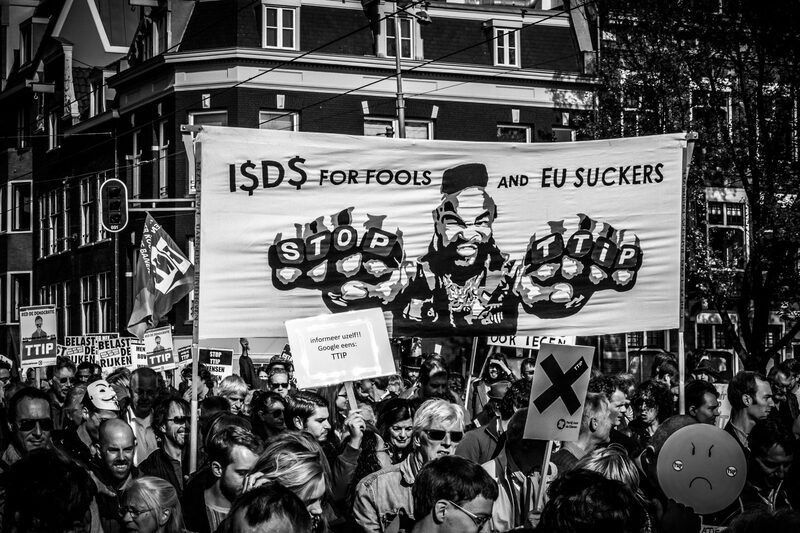 In fact, the Netherlands plays a particular role: it is the country whose corporations have filed the second highest number of ISDS cases in the last decade, after the United States. Often these are not actually Dutch companies but ‘letter box companies’ who are eager to take advantage of the 90 ISDS investment treaties the Netherlands has enacted with other countries in total. ‘We are living in the golden age of investor-state dispute settlement’, wrote arbitration lawyers Theodore Posner and Dániel Dózsa in 2013. The arbitration industry (consisting of law firms, arbitrators and institutions1 that hear ISDS cases) has profited greatly from the clause. A 2012 study calculated that legal costs for a single ISDS case amount to $8 million2 on average. But the arbitration tribunals (‘neutral forums’ as Brower calls them) have repeatedly been the target of criticism. George Kahale, an investment arbitrator from the United States, even refers to ISDS as the ‘Wild West’ of international law, in which claims of ‘unprecedented’ amounts are awarded on dubious grounds – ‘dubious’ because different arbitration tribunals regularly interpret the same laws in different, inconsistent ways, says Kahale. Canadian professor Gus Van Harten is also critical. On the website of the Centre for International Governance Innovation, he writes that there are ‘myriad conflicts of interest’ at play within the ISDS sector. For example, lawyers may serve as arbitrators in one case and legal advisors to a government or a corporation in the next. This gives them ‘an evident interest to encourage claims in order to grow ISDS as a business’, says Van Harten. ‘Corporate giants and the super-rich, alongside the ISDS legal industry, have been the main beneficiaries of ISDS by far’, he concludes. At the same time, the benefits of ISDS for the investors’ host countries are not always clear. For example, the president of Ecuador (a country that has been the target of 23 ISDS cases in total) assembled an investigative committee to look into the net effect of investment treaties for his country. The committee concluded that the treaties provided ‘no benefits’ and created ‘nothing but risks and costs’. Ecuador did not receive significantly higher investments from countries with which it had a bilateral investment treaty, while at the same time, it has been forced to pay $1.5 billion in ISDS claims (along with $156 million in legal costs). The Ecuadorian government reached its conclusion: on 16 May 2017, the country withdrew from all its investment treaties. Ecuador is not the only country that has had enough of ISDS. Following the dispute with mining company Foresti, South Africa unilaterally withdrew from a number of its ISDS treaties. India and Indonesia have done the same. Even in wealthier countries, criticism is growing. 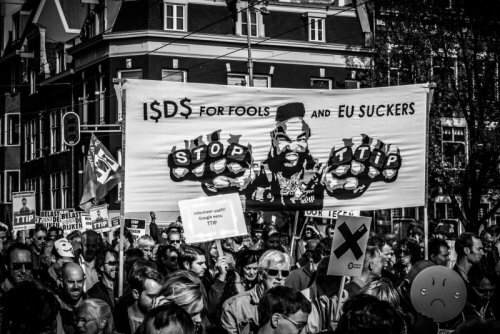 In response to the threat of an ISDS clause being included in TTIP (the trade agreement that is pending between the EU and the US), hundreds of economists signed an open letter to the United States Congress. The letter issued an unequivocal warning against the clause, with the economists calling on their representatives to ‘protect the rule of law and our nation’s democratic institutions and sovereignty’. UNCITRAL has decided it is time to put this legal weapon up to international debate. This international body (the United Nations Commission on International Trade Law) was founded in 1966 and consists of delegations from 60 UN countries. One of its responsibilities is to establish rules3 that determine how ISDS cases are conducted. In 2017, the commission began a series of talks to take stock of the concerns related to ISDS and design possible reforms. Eventually, such reforms are intended to be accepted by the United Nations, following ratification by national governments, and would apply to existing treaties. ‘Working Group III’ has been tasked with conducting these talks. This is a working group within the commission, including representatives from all 60 UNCITRAL member states4. The working group’s mandate clearly states that the negotiations must be ‘government-led’ with ‘high-level input from all governments’. This addition to the mandate was made for multiple reasons. First, the mandate recognised that different nation states had ‘different experiences and expectations’ of the ISDS regime. Second, UNCITRAL is known for speaking with many ISDS lawyers, because the negotiations often deal with many purely technical matters, according to Australian lawyer Anthea Roberts. However, this time, the debates are ‘highly political’, writes Roberts. ‘The worry was that arbitration practitioners would attempt to stall, thwart or water down any reform attempts on the basis that they have a vested financial interest in maintaining the status quo.’ Specifically for this reason, writes Roberts, the mandate emphasises that the debate must be truly ‘government-led’. The most far-reaching ‘plan for improvement’ is a permanent international investment court (the Multilateral Investment Court, or MIC), similar to the International Court of Justice in The Hague. Europe has proposed this repeatedly in the past with support from Canada.6 The court would maintain a permanent pool of arbitrators, replacing the ad hoc arbitration tribunals in ISDS proceedings. The EU claims that this ‘it is the only suggested option that can successfully respond to all of the concerns identified’. According to the EU, the plan would deter conflicts of interest among arbitrators, making them more impartial and improving the consistency of their rulings while also reducing the costs of ISDS proceedings. It should be noted that the plan lacks the support of other crucial players. Kelsey points out that the US and Japan, among other countries, find the proposal too far-reaching and are calling merely for ‘technical reforms’ of the rules. Additionally, more sweeping reforms are possible, according to an open letter recently published by 44 academics. Their desire is for countries to also be allowed to sue corporations under ISDS instead of only vice versa. They also want to give third parties (such as victims of environmental damage or human rights violations by corporations) the right to be heard in ISDS cases. Finally, the most far-reaching idea, which is endorsed by several NGOs, is a multilateral, coordinated effort to abolish ISDS. This week from 1–5 April, the fourth plenary session of the UNCITRAL Working Group III is being held in New York. ‘Phase two’, the selection of topics for which reform is desired, is already in its advanced stage. ‘Phase three’, in which these reforms will be designed, will possibly already commence this week. Verbeek has also noted the lack of proportionality during the past two sessions, in April (New York) and November (Vienna) of last year. ‘The chairs are even empty where the delegates from some of the poorer countries should be’, he says. In his view, these countries are clearly in a weaker position in the discussions than the wealthier Northern countries and they ‘struggle more often with a lack of resources and expertise in the field of ISDS’. According to the minutes from the most recent session, twelve of the 60 countries8 were absent, including Hungary, Libya and Lebanon – all three of which have been subjected to multiple ISDS claims in the past. ‘Benin is also noteworthy’, said Verbeek. Belgian lawyer Quentin Declève, who single-handedly represented the small African nation, had just one message: ‘He took the microphone and said that Benin supports the European proposal of a permanent investment court.’ This was confirmed on the website of Declève’s law firm Van Bael & Bellis, a firm that also handles ISDS cases. The firm says it is representing Benin within UNCITRAL as part of a pro bono programme. So, how much influence do these governments have? The US, which is the country from which most ISDS cases originate, was represented by a relatively large delegation of nine members, three of whom were lawyers from the ISDS sector. And that is a major problem, according to critics. The entire debate has been dominated by one type of stakeholder: the ISDS lawyer. American NGO Public Citizen even wrote that the entire process has been ‘hijacked’ by these lawyers. Professor Kelsey, a member of the academic advisory body established for the working group, agrees that ‘the arbitrators have been very influential in framing the discussions’. Several important leadership positions within the working group are even held by ISDS lawyers. Secretary General Anna Joubin-Bret, for example, was formerly a partner at the Parisian law firm Foley Hoag. She has participated in five ISDS cases as an arbitrator and has counselled developing countries on enacting investment treaties. The chairperson of Working Group III, elected by a thin majority, is Canadian lawyer Shane Spelliscy.10 The original chairperson of the advisory Academic Forum was Swiss lawyer Gabrielle Kaufmann-Kohler.11 All three regularly work on ISDS cases as arbitrators or legal advisors. The numbers reveal just how heavily ISDS lawyers are represented within the working group: at the latest session, held in New York last November, at least 28 of the 281 member of government delegations were lawyers from the ISDS sector.12 In the two advisory bodies set up for the working group, the percentage is even higher: 62 of the 122 members of the Academic Forum are ISDS lawyers, while the Practitioner’s Forum consists entirely of ‘expert practitioners’ in the form of 32 ISDS lawyers. The external stakeholders who participated in the last three sessions were primarily professional associations of lawyers, arbitration institutions and academic institutions with close ties to the ISDS sector. Furthermore, Public Citizen, an NGO that is highly critical of ISDS, denounced to have been rejected as an ‘observer organisation’ by the secretariat. New Zealand professor Jane Kelsey expects that the debate will ultimately result in ‘old wine in new bottles’. For her, ‘the question is whether the reforms they will adopt are enough to buy off the critics’. She does not expect to see fundamental change, because crucial aspects have been left off the agenda. ‘The discussion has been narrowed to three specific, procedural aspects of ISDS, and the broader criticism is being ignored’, says Kelsey. Improving the consistency of ISDS rulings, increasing impartiality among arbitrators and limiting the costs of ISDS cases: all three topics deal with the procedure of ISDS cases, not the scope. The real substance, the rules for investment treaties themselves13, are not on the agenda. Indonesia has already denounced this limited approach. Which proposals for reforms will be brought to the table? Verbeek has reviewed a provisional ‘menu’ of ISDS reforms14 prepared by the secretariat last November. ‘The most far-reaching proposal was the permanent investment court’, he says. All other proposed reforms do not go as far. These include introducing an appellate authority that enables states to appeal against the rulings of arbitration tribunals. There are also the more moderate ‘soft law’ solutions, such as the proposal for countries to draft ‘joint interpretations’ of the rules in investment treaties. This would help arbitration tribunals to achieve greater consistency in their rulings, explains Verbeek. Kelsey and Van Harten are not convinced. In a joint publication, they claim that ‘the contributions of a number of participating governments suggest there is no consensus’ on limiting the debate to procedural aspects of ISDS. Recordings of the debates and published minutes from the meetings reveal that there is disagreement on this, they claim. According to them, it is merely the interpretation of ‘some members of Working Group III’ that the mandate prescribes such a delimitation. Canadian professor Van Harten notes that even within the advisory Academic Forum, the research agenda is limited. This is one of the reasons15 why he resigned from the academic advisory body in the autumn of 2018, after serving on it for half a year. Yet, this was hardly surprising to Van Harten. ‘If you go to these kinds of meetings, you’re often surrounded by all kinds of people who are advocates of ISDS in the field or in the academic world. I’ve seen this enough times to know that my time is better spent elsewhere.’ He now intends to publish his academic recommendations to UNCITRAL Working Group III independently.